Just like traditional dSLR photography, HDR requires that you set up your camera and gear. If you plan on shooting HDR, you might have to change some things, and some things you would be setting up anyway. Don’t worry. HDR isn’t a gigantic deal. There are a few things you’ll have to do differently, but not many. Shooting mode: Set to Aperture priority or Manual mode if you’re shooting brackets using your camera’s AEB feature. Set to Manual mode if you’re handling the bracketing chores yourself. Image Quality: Set to raw for best results. Set Release (Drive) Mode: If you’re shooting auto brackets, set Release Mode to High Speed Continuous. That way you can take the bracketed shots with one press of the shutter release button and in the shortest amount of time. If you’re manually bracketing, set the camera’s drive to single shot. ISO: When shooting brackets with the help of a tripod, set ISO to a minimum value to keep noise down, and make sure Auto ISO is off. If you’re shooting hand-held, you may want to raise the base ISO so you can get a faster shutter speed. Noise Reduction (NR): Turn off in-camera noise reduction to ensure a good frame rate when using AEB. Auto Exposure Bracketing: Turn it on and set it up. When returning to normal photography, make sure to turn off auto bracketing. Lens: Wide-angle lenses are great for HDR photography, but only due to the fact that many people shoot landscapes in HDR. Use the lens that matches your subject. Tripod: HDR and tripods go hand in hand. The only difference is that you’ll be shooting exposure brackets, not different shots. If you have a fast enough frame rate and AEB, you may want to ditch your tripod and try shooting hand-held brackets. If so, make sure the shutter speed is fast enough on all brackets to avoid blurring. Batteries: Double-check your camera’s remaining battery power. Memory card: Make sure that you have enough memory card space to store the photos. Bracketing eats up space, especially if you’re saving raw photos and JPEGs! White balance: Set the white balance to match the scene. Otherwise, leave it on Auto. Vibration reduction (VR): Turn off VR if the camera is on a tripod or is otherwise solid. If you’re shooting hand-held, keep VR or image stabilization (IS) on. Metering: You’ll be capturing enough range for metering not to matter if you’re off by a hair. Leave in your camera’s pattern mode unless you have a good reason to change it. Focus: Choose a focus mode that works best for the given situation. Most of the time, autofocus (AF) works very well and you don’t have to worry about it. If the setting’s dark, you may need to switch to Manual mode. This way the camera will focus on the exact same spot in every bracket. Other photo settings: Set size, aspect ratio, and color profile, as desired. Not all cameras have an auto exposure bracketing (AEB) feature. If you can’t find it anywhere in the menu system, you may not have one of them. By and large, the least expensive entry-level dSLR cameras lack AEB. Learn about your camera’s AEB feature before you venture out intending to use it. Should your camera have any AEB settings you can choose yourself, use the menu system to confirm or change them. Set the number of brackets to shoot. You may be able to choose from two to nine exposure brackets. If possible, set the number of brackets based on how much contrast you need to capture. In general, the more brackets you can shoot, the larger the overall dynamic range will be. This results in more information. For normal scenes, shoot at least three brackets separated by 2.0 EV or five separated by 1.0 EV. For very high-contrast scenes, shoot anywhere from five to nine brackets. Set the exposure variation (EV) between the brackets. Normal values are either 1.0 or 2.0 EV. You may be able to select a difference anywhere from 0.3 EV to 3.0 EV between each photo. This difference doesn’t refer to the total EV range of the bracketed set. Usually, three brackets separated by 2.0 EV works fine. You may miss some dynamic range if the scene has a tremendous contrast between lights and darks. If you’re shooting five or more brackets, 1.0 EV works well. If possible, set the EV distance based on how smooth you want your images to transition from one exposure to another. This results in potentially more realistic images. Common exposure differences between brackets are 2.0 EV and 1.0 EV. Sequence: Set the order the shots are taken. Most often, you can put the metered exposure first, in the middle, or last. The other exposures tend to be taken from dark to light. 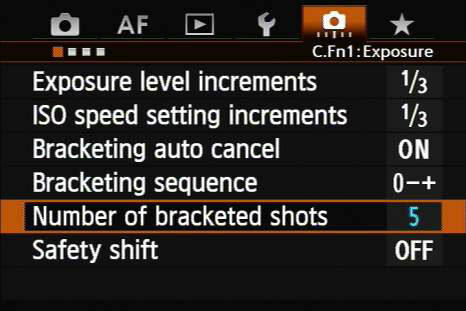 Auto cancel: Most of the time, bracketing is canceled when you turn off the camera. Some cameras restart the bracketing sequence where you left off if you turn the camera off and back on. If you have a camera like this and don’t like that behavior, you may be able to turn it off. Bracketing option: Some cameras lump several different types of bracketing together. You may have to identify that you want exposure bracketing as opposed to white balance or another type of bracketing.